Join us for an evening of food, wine and fabulous tunes as the acclaimed ‘Pocket Orchestra’ tour our estate with their toe tapping jazz. 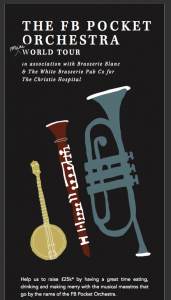 Help us to raise £25k for The Christie Hospital by having a great time eating, drinking and making merry with these musical maestros! The event is £30 for a three course set menu, glass of wine and the great music with 50% going to the hospital fund in memory of our much-loved colleague, Rob White and our good friend Tim Bacon, both or whom were treated at The Christie during their battles with cancer.